Watch Paul D’Amore on Midday Maryland discuss the importance of school bus safety and the most common reasons for bus accidents to watch out for this year. Back in May of this year, five children were injured in Churchville, Maryland when the school bus they were riding collided with a tractor-trailer. The police report showed the tractor-trailer was stopped when the school bus rear-ended the vehicle and the driver blamed a child for distracting her from the road. Another school bus accident this past May in New Jersey resulted in the death of a teacher and a student after the bus collided with a dump truck. Investigations after the accident showed the school bus driver had at least 16 traffic violations and his license suspended 14 times in the past four decades- eight of the violations were for speeding. A school bus accident is one of the worst possible events that could happen to a family, school, and community. The NHTSA reported 1,282 fatalities due to school-transportation-related crashes between 2007 and 2016, averaging about 128 fatalities per year. School bus drivers take on a significant responsibility when they agree to transport our children to and from school, which is not an easy task as our roads become more dangerous every year. Bus drivers face a number of road hazards while performing their jobs and they are expected to know how to navigate around them safely to reduce the chances of injuries. Yet, in light of recent bus accidents, several concerning risk factors have been brought to light regarding school buses and drivers that are causing parents to fear putting their kids on a school bus this year. Distracted driving accidents are responsible for taking thousands of lives every year. The NHTSA reported at least 3,450 road fatalities and more than 480,000 injuries were due to reckless distracted driving accidents just in 2016, and the problem is only getting worse. Internal Distractions: School buses can carry on average of 30 to 100 students in their vehicle depending on the type of trip. Even though discipline policies are generally in place for proper conduct on the school bus, some students ignore the rules. Students of all ages are capable of acting up and causing chaos on the bus but not all drivers are trained on how to address bad behavior without putting their passengers and other motorists on the road at risk. Outside Distractions: A number of school bus accidents involve other vehicles who were not paying attention. Distracted teen drivers on their way to school or adults on their route to work are colliding into school buses, and it’s nearly impossible for bus drivers to maneuver their large vehicles away in time. Self-inflicted Distractions: Even though school bus drivers are given the role of protecting our children during transport, they are still choosing to partake in reckless behaviors such as texting, eating, and using other electronics while driving. The NHTSA estimates that if a driver even looks away from the road for five seconds going at least 55 mph, they could travel the length of a football field before looking back at the roads- that’s a lot of opportunity for accidents. Why under any circumstance would a school employ a bus driver with a reckless driving record? The reason is not as straightforward as you might think. Most schools outsource the responsibility of hiring school bus drivers to bus contracting companies. Over the past few years, nationwide bus driver shortages have caused significant struggles for these companies when it comes to hiring and maintaining quality drivers. In a survey released by School Bus Fleet Magazine, at least 22 percent of private bus contractors reported a ‘severe’ shortage in school bus drivers, 5% of these companies identifying their shortages as ‘desperate’. Contracting companies in desperate need of employees are more likely to employ bus drivers who have traffic violations or even fake CDL licenses in order to fill positions for the school year. They may also feel pressured to keep drivers on who have multiple complaints regarding there driving behaviors, especially when there is no one lined up to replace them. Nearly twenty-three million kids ride a school bus every day across the United States, and most of them do it without a seat belt. The Center for Disease Control and Prevention (CDC) identifies seatbelts as one of the most effective ways to save lives and reduce injuries in vehicle accidents. So why don’t all school buses have these life-saving devices? An article published by Business Insider in 2012 states that school bus seats are designed not to need seat belts. Placed close together, high, and padded, these seats are supposed to absorb the impact of a child in a crash, without the need for a seat belt. The article also states the cost of installing seat belts on buses would outweigh the safety benefits. However, after the fatal New Jersey school bus accident this past May, safety advocates around the country are changing their tune when it comes to seat belts on school buses. For the first time this year, the National Transportation Safety Board (NTSB) is recommending that all new buses are equipped with lap and shoulder seat belts. Currently, only eight states have laws that require large buses to have seat belts for passengers. Other states rely on each school district to determine if they want to spend the money on the safety measure or not. However, with many schools already back in full swing, millions of lives remain in danger due to lack of seat belts, with no word on whether there is a plan for renovating older school buses currently in operation. We can’t control every factor that causes tragic school bus accidents but implementing certain safety precautions for districts and drivers to follow could significantly decrease the risks of increased accidents. Develop training programs to address distractions: Districts should adopt policies that prohibit distracting behaviors such as cell phone use, eating, drinking, and other reckless habits. Drivers should be trained in the dangers of these behaviors and reprimanded accordingly if caught performing any of these while driving. Train drivers for outside distractions: Driver should be properly trained to recognize other reckless drivers on the road and how to maneuver their vehicle to avoid accidents. Adopt a school bus safety code of conduct: Students need to be held more accountable for their behavior on the school bus and understand how their actions can impact the bus driver. Involve the parents: Schools should be getting parents highly involved in discussing the bus code of conduct with their kids to make sure they understand the dangers of poor behavior and avoid distracting the driver. Train drivers to respond to bus chaos: Drivers should be prepared to act appropriately when students are acting up during transport. Students can’t be expected to behave all the time, but drivers must learn how to remain consistent and calm in their approach. Crash avoidance technology: Passenger vehicles have had advanced safety features for years. Bus drivers could greatly benefit from crash avoidance technology to assist in avoiding accidents in help in avoiding other distracted drivers on the road. Negligent drivers or drivers with past records of reckless driving behaviors should never be hired or kept on staff out of desperation. More oversight is needed for bus contracting companies to ensure safe drivers are the only individuals operating the school buses that transport so many young lives to school every day. Lastly, with new school buses being manufactured with seat belts, Maryland and other states need to follow the lead in making sure all older operating school buses are equipped with seat belts that could save lives and prevents thousands of injuries. School bus seats might be designed to absorb the impact of a child, but seat belts are the only method to keep a child grounded to prevent being ejected from their seats in the case of a collision or rollover. As a parent, you have the right to expect that your child will arrive safely at school. 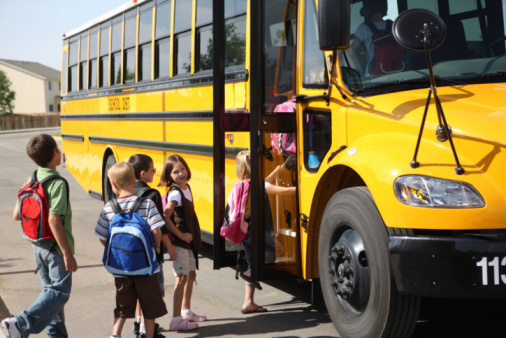 If your child has been injured in a bus accident due to the negligence of a driver or lack of safety measures on a school bus, D’Amore Law is here to help you seek justice for damages sustained. Contact us for a free case evaluation to see if you are eligible for substantial compensation for your child’s unnecessary injuries.